The Bluebox doesn’t look like a traditional classroom, and it doesn’t function like one either. As a high-tech experimental learning space, it’s not meant to, as it is anything but traditional, and in coming semesters more rooms like it are slated to launch across Penn State’s campuses. Designing and implementing the spaces comes as part of the University’s ongoing efforts that have helped make it a worldwide leader in educational technology. The Bluebox, launched in 2016, is designed to increase student engagement and support active, collaborative learning pedagogies. Its design, along with its versatile nature, is the latest manifestation of decades of Penn State’s educational research around active learning. 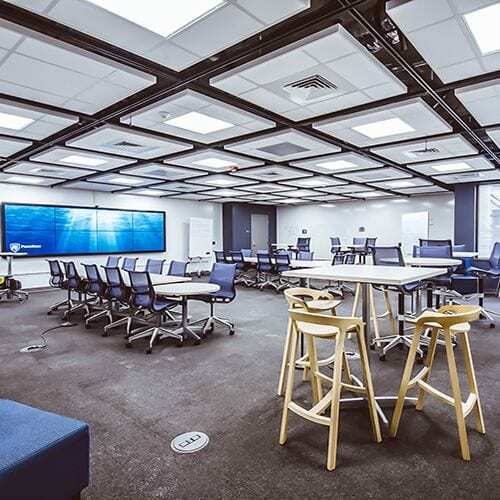 This research has shown time and again that a more dynamic and flexible learning space yields positive results when compared with the increasingly outmoded classrooms and lecture halls that many still define as the essential standard for university classes. “Traditional classrooms are set up for students to sit in rows and listen to a professor at the front of the room, and this setup is not conducive to teaching with the idea that learning is an active and interactive process,” said Sarah Ades, associate professor of biochemistry and molecular biology who has taught a class in the Bluebox. Everything you see in the Bluebox is there (or not there) for a reason backed by science, student and faculty experience, or both—which is what really makes it stand out in the experimental education field. The studio combines easily movable and adaptable furniture and whiteboards with higher-tech educational tools, like several displays that allow for wireless projection, and can be quickly reconfigured to accommodate a professor’s or class’s needs. To keep pace with evolving research and technology, it is designed to undergo more structural changes every semester as necessary. Instructors can use or not use whichever classroom components are appropriate for their learning outcomes. Some prefer to use all of the screens and modular tables available, while others have found that clearing out everything except the mobile chairs and whiteboards works best for a particular teaching session. The robust support structure serves as one of the classroom’s most unique multi-faceted components. Instructional designers, technologists, and a research team dedicated to continuously evolving the space and helping instructors use it in the best ways for the classes they’re teaching and the results they’re hoping to achieve are available to help faculty using the space. The instructors who teach in the Bluebox meet monthly as well to discuss how they’re using the space, what is working well, and how the space and learning experience can improve. The Bluebox is the first room of its kind at Penn State, but it certainly won’t be the last. The space has served so far as a sort of litmus test for how the University will proceed in its future classroom designs and updates. The University is taking findings from the Bluebox, combining them with its ongoing scientific research, and using the information to help plan for how spaces will be redesigned across the Penn State community. If the Bluebox is any indication, it’s likely the demand for experimental learning spaces will be high. By its second semester of availability, the Bluebox was completely filled, and the university had to turn away interested instructors heading into the Fall 2017 semester. “We plan to grow these experiences, and demand will push development,” said Sparrow.